ALMA does not use one single antenna for observation purposes but rather 66 receivers, precisely controlled and interconnected to form a giant telescope. Exact positioning of the antennas weighing several tons is of decisive importance, and this is ensured by angle encoders from HEIDENHAIN among other factors. The international ALMA project is a source of prestige for all those involved. Although the observatory is to be completed in 2013, it was already supplying breathtaking images from the depths of the universe on October 3, 2011. 25 of 66 antennas are from Europe, and equipped with angle encoders from HEIDENHAIN. It is this alone that makes precise positioning of the antennas possible, each weighing several tons, as maximum precision is needed for next-generation astronomical observations. The ALMA observatory in the Atacama Desert in northern Chile is the most powerful radio telescope in the world, and the world’s most complex terrestrial observatory. With ALMA, short for “Atacama Large Millimeter/Submillimeter Array,” astronomers aim to investigate remote galaxies and search for the building blocks of solar systems and inhabitable planets. Construction of the observatory is not yet complete, yet the unexpectedly high level of precision has caused furor throughout the world. Until now around a third of the 66 radio antennas planned have been set up on the desert plateau at a height of 5,000 meters. 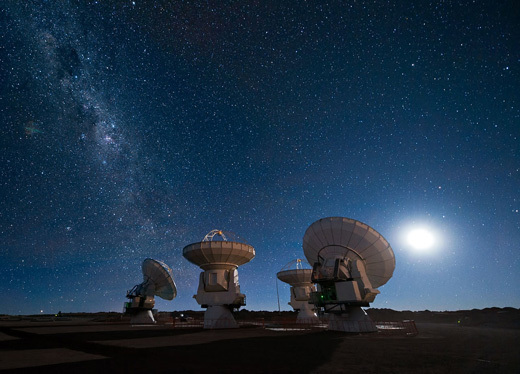 ALMA does not use one single antenna to observe the cosmos but several receivers positioned precisely and interconnected to become a single telescope. Alma Correlator, one of the most rapid specialized supercomputers in the world, calculates the image data of the antennas to produce a general overall view. The coupling of the antennas to produce a giant telescope enables ALMA to capture images of celestial bodies at a distance of many millions of light years. Exact positioning of the antennas weighing several tons is of elementary importance, and the slightest imprecision distorts the result and lead to blurred images. A decision was taken by those responsible for the 25 European radio antennas to order angle encoders from HEIDENHAIN. 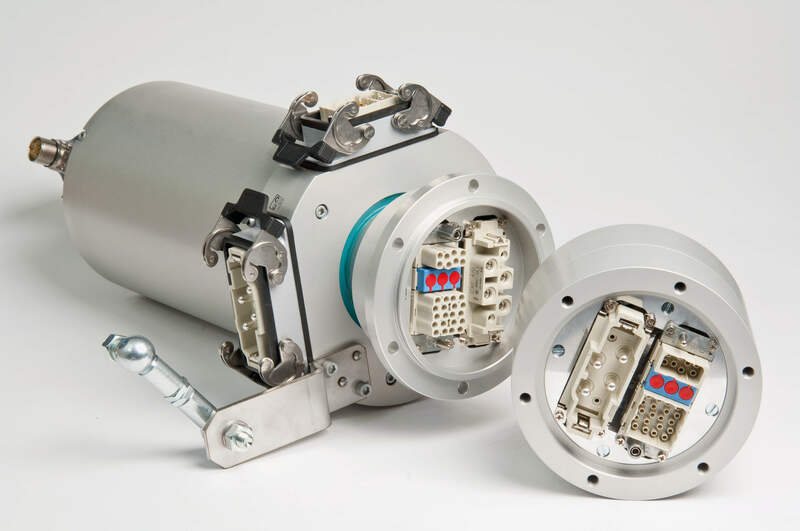 The company from Traunreut in Upper Bavaria, Germany has been developing angle encoders for almost 60 years and is thus a pioneer in this sector. With outstanding measurement precision and a high level of long-term stability, these devices ensure the required accuracy for alignment of the ALMA antennas. A special strength of the HEIDENHAIN angle encoders used in the project is outstanding precision within one signal period. They function without contact and are thus especially suitable for use in precision devices. To align the horizontal angle (azimuth) with precision, the European ALMA antennas use the new incremental ERA 7480C angle encoder with 247,800 scale lines and a diameter of 3155 millimeters. The ERA 7480C was specifically developed for use with the ALMA and the tape length was adapted precisely according to the required diameter. Achievable precision was simulated beforehand as a part of project development. The ERA 7000 angle encoders consist of a scanning unit and a one-piece steel scale tape as graduation carrier. The vertical angle (elevation) is set by the researchers in Chile with the aid of the ERA 4282C angle encoder from HEIDENHAIN. The especially precise angle encoder of the ERA 4000 series with steel scale drum has 32,786 scale lines and a diameter of 209 millimeters. The interface electronics from HEIDENHAIN adapt the encoder signals to the interface of the subsequent electronics. The new external EIB 749 interface box interpolates and compensates the output signals from the scanning head, and position values are output via Ethernet to the antenna’s control computer. Products from HEIDENHAIN ensure that machines and plants work productively and efficiently. DR. JOHANNES HEIDENHAIN GmbH develops and manufactures linear and angle encoders, rotary encoders, digital readouts and numerical controls for demanding positioning tasks. HEIDENHAIN products are used primarily in high-precision machine tools as well as in plants for the production and processing of electronic components. With extensive experience and expertise in the development and manufacture of measuring devices and numerical controls, HEIDENHAIN creates the groundwork for the automation of tomorrow’s plants and production machines. The ERA 7480C angle encoder consists of a scanning unit and a one-piece steel scale tape as graduation carrier. The steel scale tape is supplied by HEIDENHAIN as standard to a length of 30 meters and significantly longer on request. Circle segments are available in applications with no full circle or if measurement is not required over 360°. 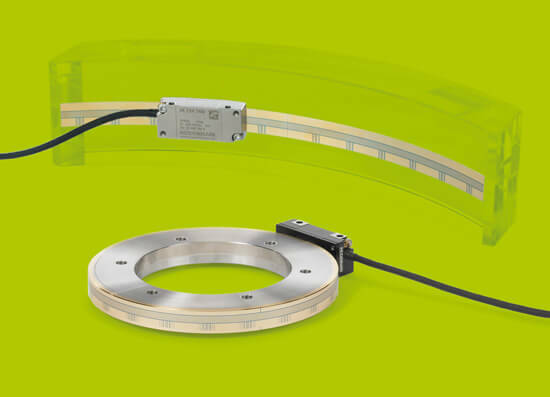 The ERA 4282C modular encoder consists of a scale drum and a highly compact scanning head. Angle Encoders The term angle encoder is typically used to describe encoders that have an accuracy of greater than ±5 angular seconds and a line count above 10,000. These angle encoders are found in applications that require the highly accurate measurement of angles in the range of a few angular seconds, e.g. in rotary tables and swivel heads on machine tools, C axes on lathes, but also in measuring equipment and telescopes. 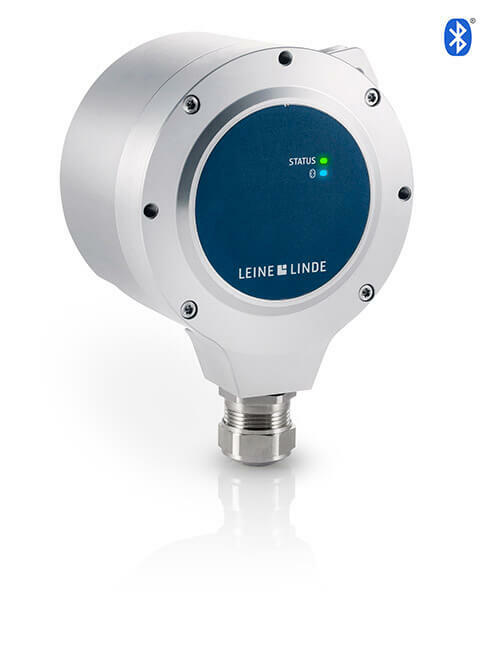 Measuring Principle HEIDENHAIN encoders incorporate measuring standards of periodic structures known as graduations. These graduations are applied to a carrier substrate of glass or steel. With the incremental measuring method used for example for the ALMA space telescope, the graduation consists of a periodic grating structure. The position information is gained by counting the individual increments (measuring steps) from a datum set to any location. Since an absolute reference is required to ascertain positions, the measuring standard has an additional track that bears distance-coded reference marks. The absolute position on the scale, established by the reference mark, is gated with exactly one measuring step.